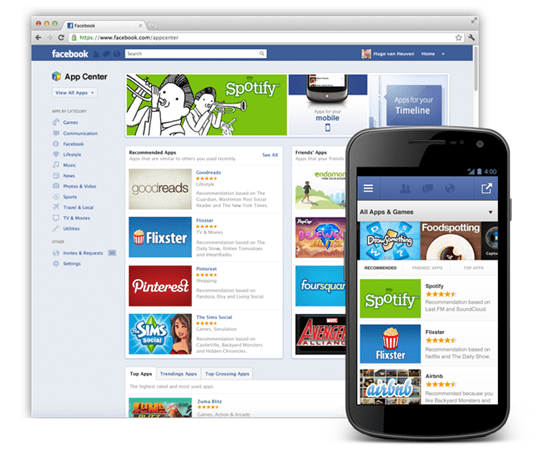 Yesterday, Facebook introduced a new App Center or search engine for Applications. It will include Applications for all platforms including web, iOS and Android. According to the Facebook announcement, the App Center will be available in the coming weeks as will the Facebook branded iOS and Android App. It will basically be a way for Facebook users to discover interesting apps pretty much like a search engine for apps. Users will get a description page for each app and they’ll be sent to the download link on the respective app store once they’re ready to buy and probably taking a little cash off the top for performing the brokerage service. Facebook is encouraging developers to get into gear and create their detail pages now in time for the launch. This can be done via a special section in the Developer app. It was obviously just a matter of time before Facebook threw its hat into the crowded App Market along with Amazon, Apple, Google and Microsoft. There is just way to much strategic value and of course money to be made by controlling the application space. As a consumer, I’ll be happy when I can buy an app from a single publisher and use it on all my devices including my Xbox, iPhone, Android, PC and MAC. Unfortunatly since Facebook appears to be more of an app broker with it’s new App Center, we will need to continue to wait. A lot would have to happen for all apps to become universal across all platforms, and I don’t think Apple will ever cooperate with a third party managing purchases. And without Apple, there really isn’t much point to that. So all Facebook will be is an aggregator of apps, which I don’t particularly find all that exciting. I do, however, think this might be part of their plan to transition to all HTML5 “apps” that run in the browser. If they get people there looking at iOS and Android apps, then they’ll also see the HTML5 apps, and start using some of those. This could make Facebook the leader for in-browser HTML5 apps, and if that’s the future of apps, they’ll be king. Friday Fun: If You Dig A Hole Deep Enough Will You Reach China?